I promised to fill you in on the Buck Brannaman clinic when I could. I’m laptopless (as I type this, I find that it appears surprisingly racy), but I’ve gotten access to a friend’s computer for a quick post. What a wonderful, down-to-earth way to sum up timing and tact. There has been an incredible depth of wonderful, down-to-earth teaching this weekend, and I’m looking forward to sharing the highlights with you this coming week. Thanks to Buck, I’m also looking forward to working cows. In preparation, based on this afternoon’s demonstration, I need to find a riding buddy and his or her horse who are willing to pretend to be a cow. I promise to trade off and be a cow, too, along with my Oldenburg. How awesome that you got to go to a clinic! I finally got to see the movie on Monday. It was really, really good – even my husband liked it a lot 🙂 I’d totally volunteer, except for the being on the other side of the world thing. Thanks for your comment, Kelly. I loved the movie. I’d been trying to get to his clinics in Maine for years and finally, the stars aligned. I know Buck travels to at least some of the other sides of the world, Australia I know but maybe not New Zealand! He was inspiring and I hope to share more about the clinic during the coming weeks. He’s actually coming to NZ in Feb 2012, which is not that far away at all! That’s a busy time of the competition season for me but I am pretty keen to go – probably just to audit. Fabulous! I learned so much as an auditor. At least during the clinic I went to, there was little one-on-one guidance during the sessions (there may have been more outside the sessions). It was as if Buck was letting people try to figure things out by doing them, and the auditors were going through a similar process — figuring things out by watching others figuring them out. 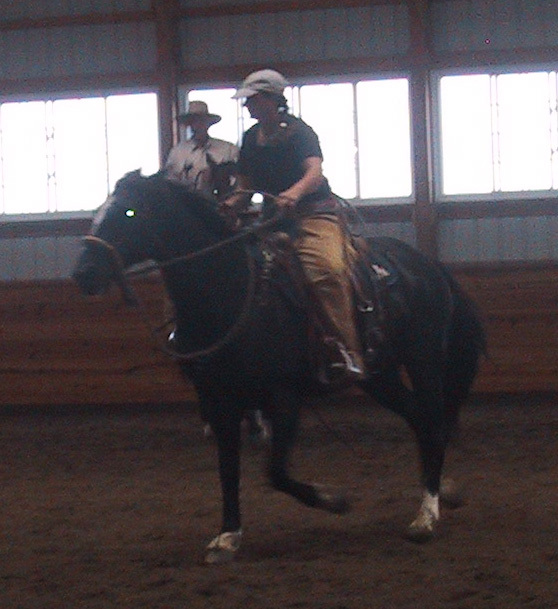 Because the exercises are the same for everyone, this was one clinic where I felt that I almost learned as much from auditing as I would have from riding.